PORT-AU-PRINCE, Haiti - As Haiti gears up for its first-ever internationally televised presidential debate Saturday, confidence in the government's ability to hold a credible poll is being undermined by allegations that President René Préval is attempting to sway the election. Details of an Aug. 16 meeting between Mr. Préval and members of Haiti's election commission (CEP) has observers questioning whether the CEP rejected candidates based on politics instead of the Constitution. The meeting came days before the CEP disqualified hip-hop star Wyclef Jean and 14 other candidates from running. It was confirmed by multiple sources and, while not in itself unprecedented or a sign of political manipulation, puts scrutiny on a supposedly independent body that is meant to ensure elections are free and fair. Mr. Préval has met in recent weeks with many of the remaining presidential candidates, which some have interpreted as a further attempt to maintain control over the election. Préval, elected in 2006 to his second term, is constitutionally barred from running again. While candidates prepare for their first debate ahead of the Nov. 28 polls, disillusionment with politics and distrust of the political elite remains high among Haiti's 4.5 million voters - many still homeless from the Jan. 12 earthquake that killed 300,000 people. Though most observers say Mr. Jean was rightly disqualified because he failed to meet a residency requirement, hopes were initially high that his star-power could bring overdue scrutiny to the election process. Yet in the larger context of what is best for Haiti, international observers say that a somewhat-credible election is better than no election for a country struggling to get back on its feet and dig its way out of 700 million cubic feet of rubble still lining the capital's streets. The eight-member CEP, entirely appointed by Préval, denies any political interference. "We are technicians, we analyzed each candidate's files according to the electoral law and the Constitution,"� Wolf Lafargue, one of the CEP's lawyers, said at a press conference in August. "We know no political pressure." 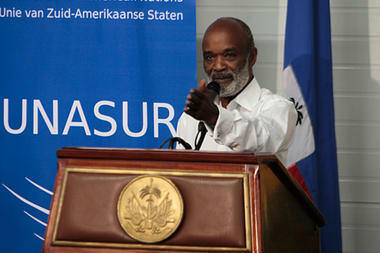 Along with Senator Latortue, who is a political rival to the current president but has not backed anyone in the current election cycle, former government spokesperson and political blogger Jean-Junior Joseph claims that three sources close to the president confirmed that Préval ordered CEP Director Gaillot Dorsinvil to bar at least one presidential hopeful. Mr. Joseph claims the CEP originally had a list of 23 approved candidates, which Préval cut to 19. He says one of the rejected candidacies was Haiti's former ambassador to the United States, Raymond Joseph, who is also Wyclef Jean's uncle and seen as a potential threat to Préval. "I did hear that a first list came out which said I was approved, then another list came out and I wasn't on it,"� the former ambassador told the Monitor. "I don't think the international community should condone such arbitrary acts and I don't think they should finance it." The CEP said it rejected Ambassador Joseph's candidacy on grounds he lacked a "Certificat Provisoire de Decharge,"� which is a state-issued certificate of fiscal accountability. But Joseph showed the Monitor the state-signed document declaring that "no irregularities of management"� were found in his accounting. In a recent op-ed, Joseph wrote that the CEP's "decision appears blatantly arbitrary, without legal grounding, and motivated by the political agendas of a small ruling elite." His rejection is also notable because CEP member Ginette Cherubin said she was uncomfortable with the point that derailed his candidacy, and for that reason refused to sign the final list of approved candidates. Ms. Cherubin was aware of the Aug. 16 meeting between Préval and several CEP members, though she says she was not present. CEP spokesperson Pierre Thibaut says he is unaware of the Aug. 16 meeting, but that "the CEP can meet with any members of the government at any time." �The CEP excluded 14 political parties from parliamentary elections and seven political parties from presidential elections, including Fanmi Lavalas, the popular party of former President Jean Bertrand Aristide. Reasons given for its exclusion do not "pass the smell test under Haitian law,"� says Mr. Concannon at IJDH. The CEP previously banned leftist party Fanmi Lavalas from senatorial elections in 2009, despite appeals from the United Nations and the Organization of American States (OAS) for the CEP to reverse its decision. Fanmi Lavalas has won with wide margins in every election in which it participated, a recent IJDH report pointed out, including 90 percent of seats in 2000 parliamentary elections. Skip to next paragraph Related Stories Haiti presidential election: justice on the line Wyclef Jean's disqualification signals Haiti diaspora not welcome in politics Is Wyclef Jean eligible to run for president of Haiti? Fanmi Lavalas has been joined by Alternative, UCADD, Rasemble, and Liberation in calling for a boycott of the November election. The latter four parties and were permitted to present candidates but backed out amid growing uncertainty over the CEP's ability to hold fair elections. Some candidates who threatened to boycott the vote have been persuaded to participate by an observation mission run jointly by the OAS and Caribbean Community (CARICOM). "They are concerned that the electoral council is not independent and is being manipulated by the president and that the president is doing everything to make sure that his party wins the election and so on,"� CARICOM Assistant Secretary General Colin Granderson told the Monitor from Port-au-Prince. The mission has operated in Haiti since August in response to a request by the Haitian government. "I can't think of any recent election where an observation mission has been there for such a long time,"� says Mr. Granderson. He says the mission has already issued recommendations to the CEP, including to disclose its reasons for dismissing candidates. But overall the international community, which is providing most of the election's $29 million price tag, appears reluctant to interfere with the election process and slow down what it perceives as Haiti's urgent need for a new government. "The international community wants to be able to recognize whatever government comes out of the process,"� says Alex Dupuy, a professor at Wesleyan University in Middletown, Conn., and author of several books on Haitian politics. "I doubt very much that they would be willing to call the whole thing into question when they were the ones pushing for elections to start with," he says. "The international community will allow the process to go forward and hope that it will be as fair as it can possibly be under the conditions." Â© The Christian Science Monitor. Published Thursday, September 16, 2010.